The business environment is constantly changing to a wider range of pressures not seen in the previous models. With a more complex business environment organizations need to be ready to accept and adjust to new conditions as they become apparent. 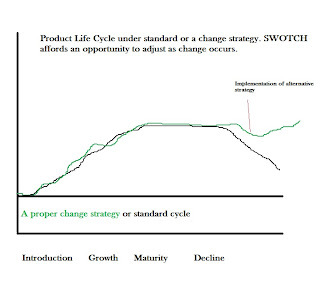 The strategies use can lengthen or shorten product and service life-cycles. Updating the common SWOT tool to offer alternative strategies and switch analysis helps to ensure businesses can adjust their strategies to strengthen their positions and thwart decline. A paper by Mayer & Vambery (2008) indicate that the current SWOT needs to be updated to include change as an additional construct in order to fit within the nature of modern global businesses. They discuss internal change (Chi) and external change (CHe) to make SWOTCHi/e. Their reasoning is that the traditional SWOT assumes a single market with a finite beginning and end to products/services. In global business there are multiple markets and uses for products. Things change on a constant basis and companies should be prepared. -Introductory: The entrepreneurial introduction of a product. -Growth: High growth to a plateau. -Mature: A leveling of sales and consistency of process. -Decline: Market decline until discontinuation. During this product life cycle the strategic decisions and considerations often impact the overall success and movement throughout the stages. For example, in the introductory stage an entrepreneur can damage the success of the product by putting time and resources into paths that are not aligned with the market. 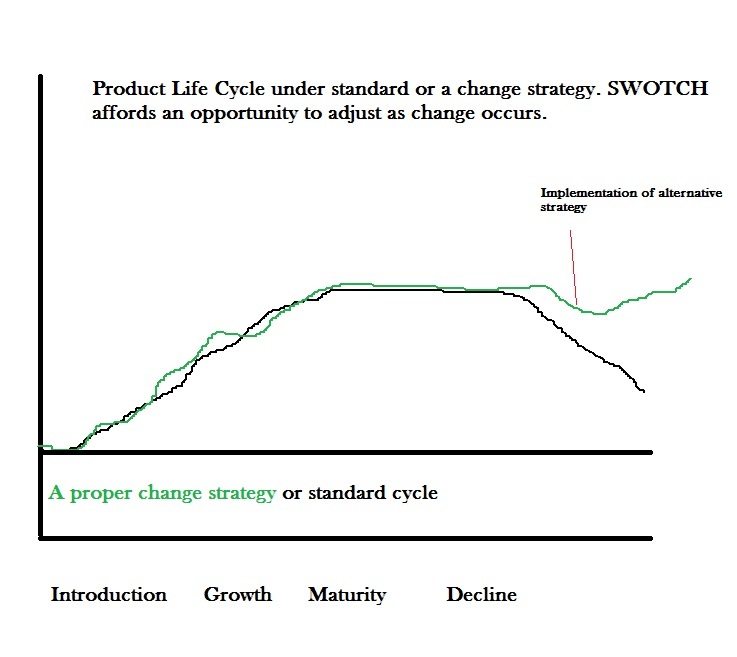 Likewise, the growth stage can be extended by strong decision making and the decline stage doesn’t necessarily need to be the end stage if adjustments to the product give it new life. The internal and external change additions to traditional SWOT offer an opportunity to reduce the static nature of the analysis based upon previous market realities. As change appears to be a modern constant it is necessary for organizations to have contingency plans. Through these contingency plans an organization can enact a new plan that capitalizes off of the gains of the initial plan when the market changes. The analysis of cost associated with a required change and the realignment of organizational components is called a switch analysis. SWOT should consider the potential for change and where their organization can capitalize on that change if it occurs within the market. The switch analysis will give them a level of understanding of effort in remobilization and adapt. We know that the market is a fluid and changing affair where five years in the future might create completely different conditions for products and services. The traditional SWOT should be adjusted so that it considers the possible strategic plan changes under a number of likely scenarios. Using the SWOTCHi/e offers an opportunity to maximize profits and minimize costs under market changes. Being aware of the potential of such changes makes companies proactive in terms of their planning and performance. Mayer, P. & Vambery, R. (2008). Aligning global business strategy planning models with accelerating change. Journal of Global Business and Technology, 4 (1).